Upington – Have you ever wondered where the colours of the South African flag come from? Oh, I’ve heard all the explanations from heraldry experts but really I think some graphic designer sat on a rock near Upington in the early Nineties, smoked some weed and beheld a male Augrabies flat lizard. I come to this conclusion – minus the weed but indeed with a glass of wine in hand – while observing several of these bright, multi-coloured cordylinae basking in the autumn sun and primping themselves for the benefit of their drab female counterparts. Looking at the lizards, it’s easy to forget I’m perched high on the edge of a cliff while South Africa’s longest river, the Orange, twists through a gorge far below before rushing into a set of rapids. So far below, in fact, that it takes me nearly half-an-hour of hearing the call of an African fish eagle before I find the bird. Its cry echoes the length and breadth of the gorge but eventually my eyes stop on a white speck in a tree on the banks of the river. And all the time, day and night, the sound of the water racing through the rocks; not the ebb and flow roar of surf but a constant susurration that in a built environment would be called white noise. 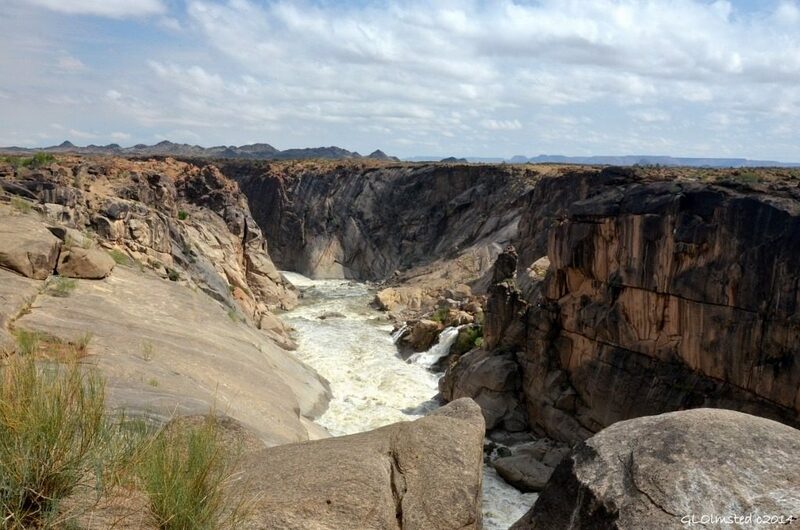 It’s not unpleasantly loud – the long-time drought in the Northern Cape and elsewhere means that river levels are seriously low but there’s an implacability of flow that precludes one from describing the nearby Augrabies Falls as “underwhelming”. A small grey mongoose snaffles a chop bone from the ashes of last night’s braai and scarpers back into a granite gully. He’s been a busy little bugger this morning because I had quite a few chops last night. When I lit the fire, the full moon was just rising. It rose at exactly the same time the sun set and the cliffs and weather-eroded rocks turned from deep ochre to a glittering silver-blue. Here on the stoep of my little cottage, I was able to appreciate it to the full. As night falls, so the world gets even quieter and the sound of the river swells. It’s comforting for those who find the silence of the southern Kalahari Desert intimidating. While the region is all about silence and space, you can’t say the same for the Augrabies Falls themselves. The name is taken from the Khoi word Aukoerebis – “the place of great noise” and, standing on the walkway above the falls, one can just imagine the spectacular tumult when the Orange River is in flood. Drought notwithstanding, the river still manages a constant average flow of between 40 and 60m3 per second over the 56m-high waterfall and into the 18km-long gorge. The park does not boast the Big Five (though there are leopard) and its isolation (at nearly 800km, it’s equidistant from both Cape Town and Joburg) means you’re rarely going to experience an inundation of visitors. In any case, most of the people who come here do so to see the falls and not many of them venture with any great purpose into the park itself. This will leave you sufficient time to enjoy, without interruption, some of the unique sightings that can be had. Apart from the lizards, I was entranced by a mother Namaqua sandgrouse and her three tiny chicks as they crossed the road in front of me. The chicks were so young that mum could not hurry off into the scrub away from my oncoming Jeep but just herded them patiently and gave them a nudge up and out of some of the ruts. Then she plopped down and let her exhausted babies, still covered in down, catch their breath. With more than 180 recorded species, the 51 000-hectare park is a boon for twitchers who will encounter birds that have adapted to a diversity of hot and generally dry habitats (with the exception of the Orange River and the adjacent riparian vegetation). But the most spectacular sights for me were the rocks and quiver trees, both gnarled and fantastic, shaped by this arid environment and intensely typical of it. It’s easy to attribute to them mystical qualities – such as the two tree stems that could at one time have been two beings dancing in the moonlight until being burned in place by the rising sun. Yes, there’s great peace in a place of great noise. Oranjekom Gorge Cottage is the newest accommodation facility at the Augrabies Falls National Park and, at R1 500 a night, it has the highest rack rate of all accommodation types in the park. There are larger and more costly units but these sleep six people, while the cottage accommodates a maximum of two. It is best described as an exclusive-use “loft-style” apartment; “loft” in the sense of “lofty” rather than “attic” because it was built at the Oranjekom view point overlooking the deep and massive Orange River gorge carved over aeons by the waters below the falls. A public lookout deck has been built above the cottage, so your privacy might be periodically invaded by other visitors. This is not the problem it might have been since Oranjekom is 10km from the main rest camp and other visitors are bound by park entry and exit times. By the same token, it’s the only dwelling for kilometres around, so you’re unlikely to be disturbed between dusk and early morning. While the self-catering cottage is modern and quite luxurious, it is not self-contained. You still have a 30m hike to the exclusive-use loo and shower. The cottage and ablution block are cleaned and serviced daily. Unlike the other semi-luxury chalets and family cottages in the park, Oranjekom Gorge Cottage does not feature air-conditioning or limited-bouquet DStv. In fact, there is limited lighting and the only electrical outlet in the cottage powers the fridge: take a multi-prong adaptor if you need to power or charge any other gadgets. The thinking behind this is that the focus of your experience is solitude and natural majesty… you don’t go to Oranjekom Gorge Cottage to watch Super Rugby. There is no minimum-stay requirement. To get to the Augrabies Falls National Park from Gauteng, drive to Upington along the N14 and then continue by vehicle via Keimoes and Kakamas to the park itself. From Cape Town, take the N7 to Springbok and turn off onto the N14. Drive through Pofadder (just so you can say you’ve been there) and then on to Kakamas. Drive back along the N27 via Keimoes and Calvinia until you rejoin the N7 at Vanrhynsdorp. Alternatively, fly to Upington and hire a car (an ordinary sedan will get you pretty much anywhere in the park). It’ll take you less than two hours to get to the park.